Lifefire Campus Ministry is a ministry that serve the Catholic Students in Universiti Malaysia Sabah. I took my degree there and was blessed enough to call to serve in Lifefire. 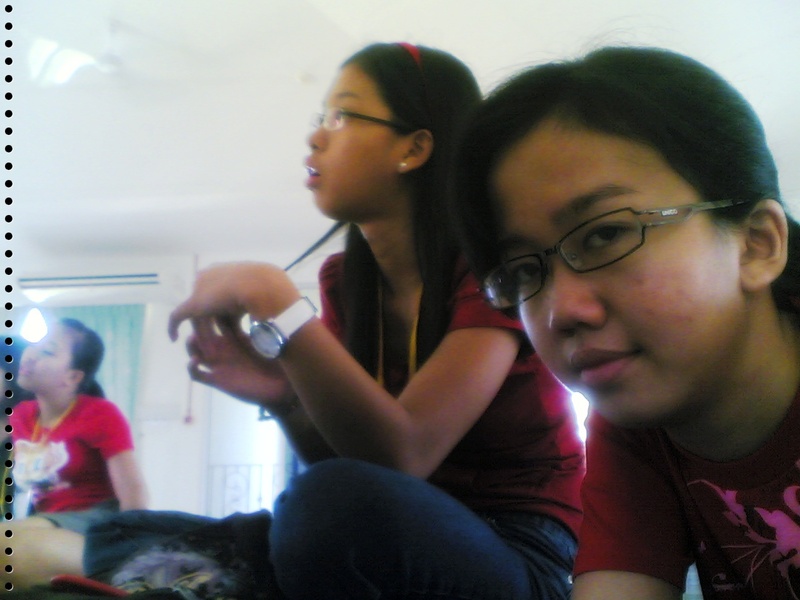 I went through my personal blog and found an old post about my first Lifefire Camp. I was in my freshmen year and was about to end my first semester. Reading this post reminded me how much I love Him even with little knowledge that I have about Him, His Ministry. 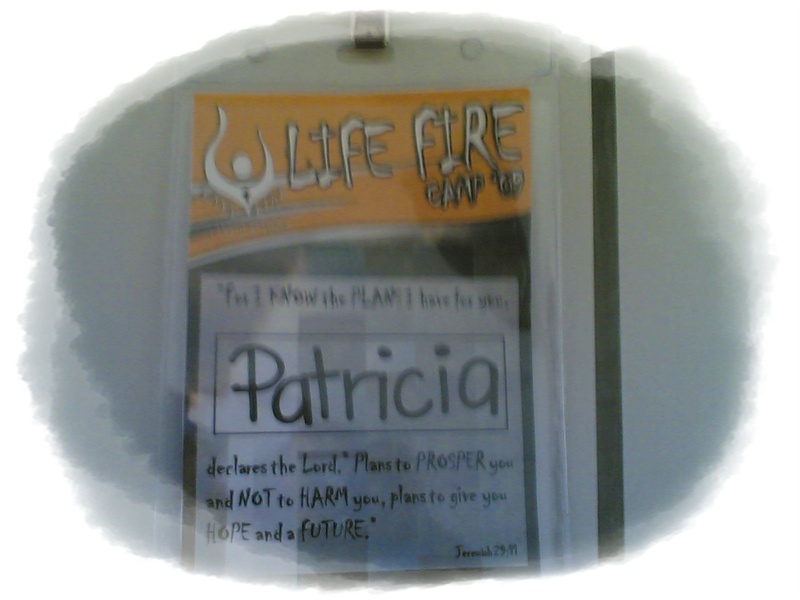 On the 8th to 10th of May, I joined a camp called Lifefire Camp. It was organized by the Lifefire Campus Ministry. Even though it was quite short period of time compared to dozens of church thingy that I ever joined. CCS-8days, MYD- 1 week, CYA-1 week. But Lifefire camp was one of the most fruitful church thingy that I ever joined in my entire life. Seriously. On the 8th of May actually was my last paper for my final exam. It was last semester’s killer paper. PENGATURCARAAN KOMPUTER DAN SIMULASI. Basically, in that course we learnt about C programming. Sounds easy for those who are taking any course that related to computer. But for computer/technology/digital thing illiterate like me, it was a suicidal course. And we were the first batch of marine science students forced to take that stupid and idiotic course. For the first time in my life, I literally felt asleep while answering an examination paper. My right hand was writing my answer and my left hand was supporting my clueless-in-programming head. 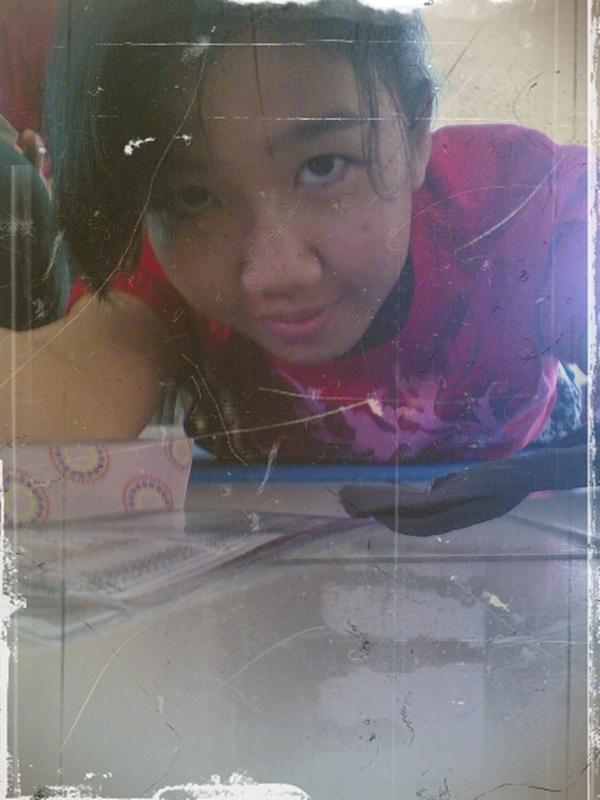 Before I knew it, my eyes were slowly closing and zzzzz. Back to the Lifefire Camp, the place we stayed there was nice. Comfortable and of course livable. (durr). Spiritually, I felt I was being renewed, recharged, re energized and every word you could possibly think of after the camp. But then there was this unexplained remorse that I experienced right after I left Pace Bene. I wasn’t sad that the camp was over. I was excited to go home, in fact. I don’t know; just felt I left something, undone. However, that sadness never stopped me from looking the bright side of joining that camp. This was my name tag, I like the way my name just fitted into the bible quote. Felt like it was “personal” and special for me to be there. Really made my presence there was not just because it was my will, but it was my answer to His call. This was brilliant. 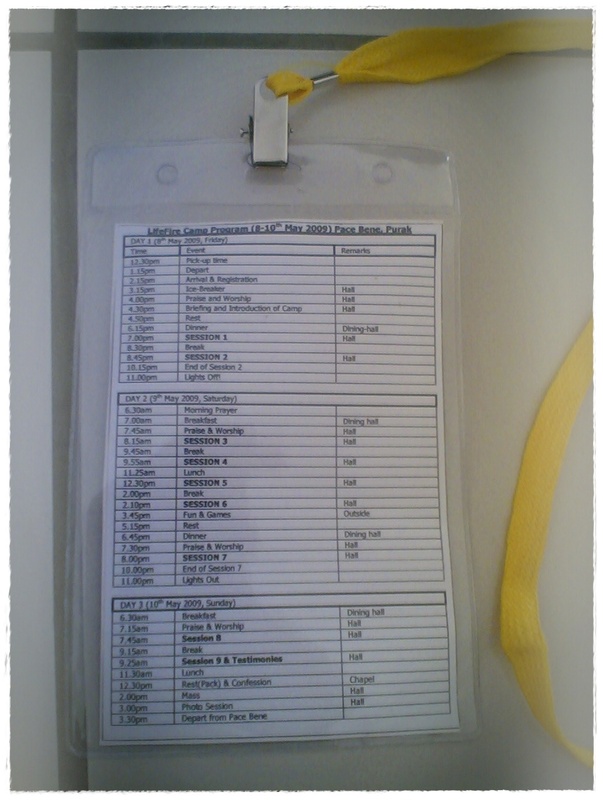 The activity schedule at the back of the name tag. I wish I could have thought of that. My J-mail. My friend, ivy and I was like “skema ni”. Letak full name gik ya. There was a lot of stuff that I really liked about that camp. The fact that we could lay, toss, and turn on the floor while listening to the talk was just… I just like it. Very much. I really glad that I join the camp with one of my closest friend, Ivy. Look at her. She was attentive, at least when this photo was taken, and I was so opposite of attentive. There is always time for self portrait. I’m not good in taking notes. My handwriting most of the time ended up almost unreadable after I jotted down something. But during the camp I managed to jot down the things that Dass, the speaker said that touched me. Here are the quotes from Dass that moved me. Even if some of it may make people go “like durr”, it still seem touching to me. 1. God gives even though He has the chance not to give. 2. God does not care why we want to come back to Him. As long as we go back. 3. We pay so much for the things that we don’t need. 4. Usually, we take God for a walk, not God who takes us. 5. How much we open our hearts, that is how much receive from the Anointing. 6. Every time we commit a sin, we slap Jesus in the face. 7. Repentance is a change of direction. 8. Be faithful in small things, God will do great things. 9. Faithfulness is the key to grow in ministry. 10. When we start to give, God will settle our needs. So, the next Lifefire camp, here I come. This post was posted on the 30th August 2009 in takeapeakintomymind.blogspot.com. The fact that Valerie was in one of these photos surprised me, who knew we are so close right now. And my dearest Ivy was next to me. 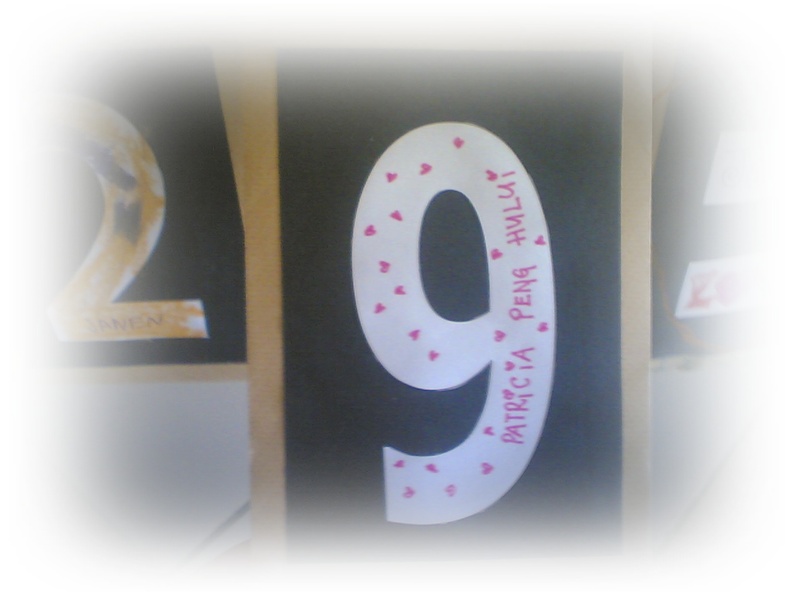 How much I miss her. You were there in the beginning of my journey. You were there throughout my journey in Lifefire. And it’s been almost two years since I left that good old ministry of mine. My love for You did changed. It has grown and continue to grow day by day. Continue to be with me in where ever You might called me, even till the far edges of this beautiful You have created. Amen.